The continent stretches nearly from pole to pole. It is so seismically active that sometimes geological events occur that can have after-effects lasting months or even years. But it is inhabited, by people who have, out of necessity, grown very hardy during these “fifth seasons.” Entire civilizations have fallen, and still the people rebuild and start over, though they devote little effort to learning much about the distant past. Remnants of it remain, however. High in the sky, floating crystal obelisks of unknown origin bear mute witness to the lives of those below. With deliberate irony, the continent is called the Stillness. Beyond that, there’s little indication its people are given to wit or introspection. World-building is a vital component of any epic fantasy, but here the world is not merely a setting but a character, a ruthless antagonist in its own right. To survive in the Stillness has required not merely stubborn determination but evolutionary adaptation. Everyone has an organ located near their brain stems that allows them awareness of the land’s seismic ebb and flow. But some people possess orogeny, the ability to manipulate and even control this activity. These people are both vitally important and exceedingly dangerous. Bigotry is a key theme at the heart of N.K. 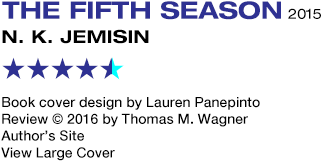 Jemisin’s The Fifth Season, a towering novel that merits favorable comparison to the best work of Ursula K. LeGuin. Orogenes are the only people who can reasonably protect the cities and communities (called “comms”) of the Stillness, and yet if they’re left to their own devices, untrained, the potential danger they present could be cataclysmic. An organization called the Fulcrum seeks out orogenes from all over the continent, and, under the watchful eye of Guardians, not only trains and educates but breeds them. So by sheer misfortune of birth, an entire class of people are brought up with the understanding that they have a lifelong duty to protect a society that fears and hates them, and suspects their power. There are three narrative threads to this story. In one, a young orogene girl named Damaya is taken from her family and brought to the Fulcrum to begin her life of training, where she’ll have a fateful encounter with another girl, not a student, forever shaping her understanding about her world. In another, a “four-ring” orogene named Syenite is assigned to accompany a high-ranking senior named Alabaster on a mission to investigate some geological troubles plaguing the harbor of a coastal comm. She has also been assigned to breed with him. This, naturally, does not get the two of them off on the right foot in terms of their regard for one another, but their relationship will become the most important in the story. On their travels, Syenite will learn something awful about the Fulcrum, and on the coast, both will run into more enemies than friends among the very people whose future survival relies upon them. What should be a simple harbor-clearing job may end up having more long term consequences. The third storyline is the book’s most striking. Narrated in second person, it follows the quest of a woman named Essun to locate her missing daughter following a cataclysm that, we are told right as the novel opens, is so severe that its resulting fifth season will be the one humanity doesn’t recover from. The world has ended “for the last time,” but this doesn’t impede a mother’s determination to protect her child. 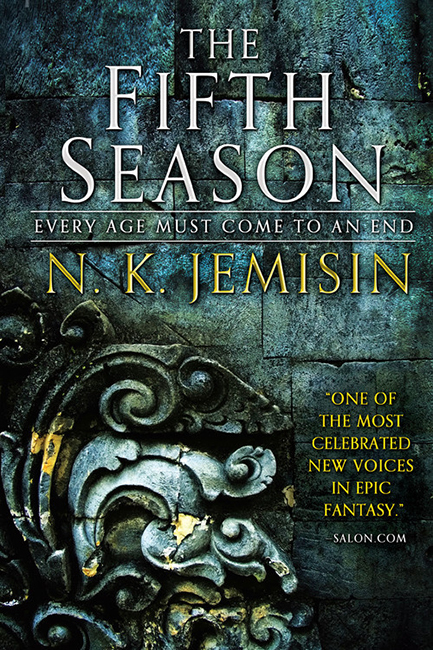 The second person voice serves two functions: it directly connects readers to Essun and her plight, and it drops a hint about the book’s overall timeline of events. Essun’s world has, in a sense, already ended. She pursues a husband who has murdered their young son for the crime of being born a “rogga” (and if that epithet for orogene sounds like a more familiar one, that’s intentional), and who has absconded with their daughter towards an unknown fate. Facing a tragedy like that, what kind of world would be left for any mother? That these stories will connect is a given. How they do connect is a stroke of casual genius. There is, for instance, a critical decision that one of these women makes that informs Essun’s entire determination to protect and even avenge her own children. If bigotry is one of the book’s main themes, family is another. There will be a moment when Syenite and Alabaster are temporarily freed — though never completely freed — from the laws of the Fulcrum and their appointed roles in serving it, where they can understand what it means to live and love and grow as normal people. Jemisin’s gift for creating an affinity between reader and character is at a career high here, and it’s been a long time since I’ve felt so anxious, and yet so committed, to following a pair of shattered heroes through their shattered world. Followed by The Obelisk Gate.